The normal joint, viewed from the side, shows the upper bone, the femur and the lower bone, the tibia. 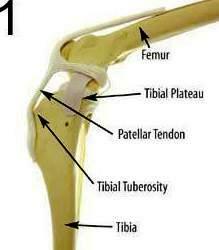 The Tibial Plateau is the actual point of contact between the femur and the tibia. In this diagram the Patellar Tendon is clearly visible. 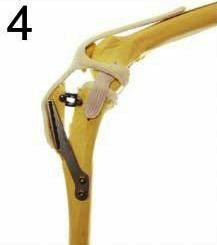 It is this structure that must offset the abnormal forces that are created with a rupture of the cranial cruciate ligament. 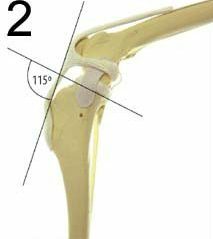 In the typical joint, the angle formed between the Tibial Plateau and the Patellar Tendon is about 115 degrees when the leg is in a normal standing position. The abnormal motion that occurs in a knee with a torn cruciate ligament is called Tibial Thrust. 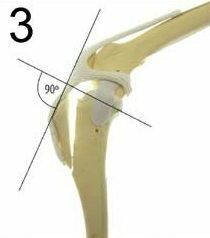 After the TTA Surgery, the corrected angle is now 90 degrees, which will offset the forces in the knee that tend to make it unstable. This diagram shows the knee once it has been stabilized with the appropriate Titanium implants. These implants are very lightweight and are designed to stay in permanently.